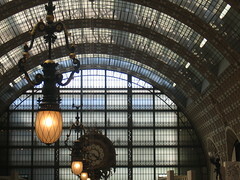 Inside the Musee Dorsey, an old railway station converted into a museum for impressionist paintings. I saw my favorite Van Gogh painting, the one of this blue room with the orange/red bed spread. Unfortunately, my friend J. also shut his finger in the door of the terrace in plein air and we got a behind the scenes tour that included the nurse’s office!